Figure CA3.1. 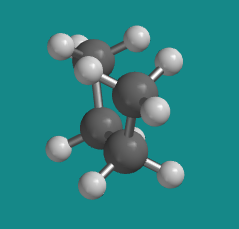 Ball-and-stick model of butane. The C-shape that it adopts here is called the "least-stable eclipsed" conformation. Go to Animation CA3.1. A three-dimensional model of butane in an eclipsed conformation. Figure CA3.2. Newman projection of butane in the "least-stable eclipsed" conformation. The "least stable eclipsed" conformation is described that way because there are two different eclipsed conformations; we will see the other one soon. Of the two eclipsed conformations, this one is less stable than the other one. In an eclipsed conformation, bonds coming from two neighbouring atoms are lined up with each other. The dihedral angle between these bonds -- the C1-C2 bond and the C3-C4 bond in the case of butane's least stable eclipsed conformation -- is 0 °. That situation introduces torsional strain. As a result, neither one of these eclipsed conformations is very stable. At 60 degrees, the molecule is no longer eclipsed, and just as in ethane the energy is a little bit lower, but the overall shape when viewed from the side is still a sort of twisted C. This shape is one of two possible staggered conformations, in which there is no torsional strain. Figure CA3.3. 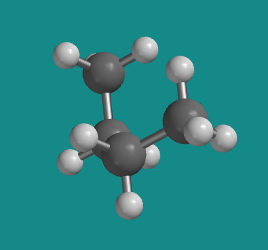 Ball-and-stick model of butane. This shape is called the "gauche conformation". Go to Animation CA3.2. A three-dimensional model of butane in a gauche conformation. Figure CA3.4. Newman projection of butane in the "gauche" conformation. At 120 degrees the molecule is eclipsed again , but from the side it has now twisted almost into a shape like the letter Z. It is clearly different from the other eclipsed conformation. This one is a little more stable than the other eclipsed conformation, for reasons that we will look into shortly. It is called the "more stable eclipsed conformation". Figure CA3.5. 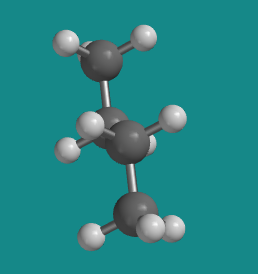 Ball-and-stick model of butane. This shape is called the "more stable eclipsed conformation". Go to Animation CA3.3. A three-dimensional model of butane in an eclipsed conformation. Figure CA3.6. Newman projection of butane in the "more-stable eclipsed" conformation. At 180 degrees, the molecule is staggered again and has settled into a regular, zig-zag, letter Z shape. There is no torsional strain, so this is one of the more stable shapes that the molecule can adopt. However, it is not the same shape as the other staggered conformer (the one we called "gauche"). This one is called the "anti" conformer. Figure CA3.7. Ball-and-stick model of butane. This shape is called the "anti" conformation. Go to Animation CA3.4. A three-dimensional model of butane in anti conformer. Figure CA3.8. Newman projection of butane in the "anti" conformation. Because of different steric interactions, the most stable conformer is the anti conformer. The second-most stable conformer is the gauche conformer. The other shapes we have looked at, the two eclipsed conformations, are not very stable at all. At room temperature, a bottle of butane gas has enough energy that the individual molecules can allow their bonds to spin around, sampling different shapes. However, at any given time, most of the molecules will be found in the anti conformer, because each of those molecules will spend most of its time in the most stable conformation. Some of the molecules will be found in the gauche conformer, because that is the second-most stable conformation. None of the molecules will be found in the eclipsed conformations, because those are points of maximum energy. The molecules have enough energy to rock back and forth a little bit, and sometimes they will not rotate all the way through an eclipsed conformation, but they won't stop there. Instead, they will keep rotating until they get to another staggered conformer. A butane molecule spends most of its time in the anti confrmer. 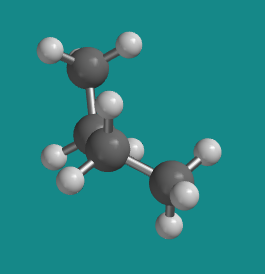 A butane molecule spends some of its time in the gauche conformer. A butane molecule spends almost noe of its time in eclipsed conformations. Note that we have two very similar words: conformation and conformer. They are related, but not the same thing. A conformation is any shape that a molecule can adopt. A conformer is a conformation that is stable enough so that a molecule can adopt for significant amount of time. Problem CA3.1. Draw Newman projections of the following compounds in a gauche and an anti conformation.